Thanks to The Design Trust for including my response in their latest blog post. I am 1 of 11 creatives to give tips on the important discussion about the negative impact of Instagram on mental health. 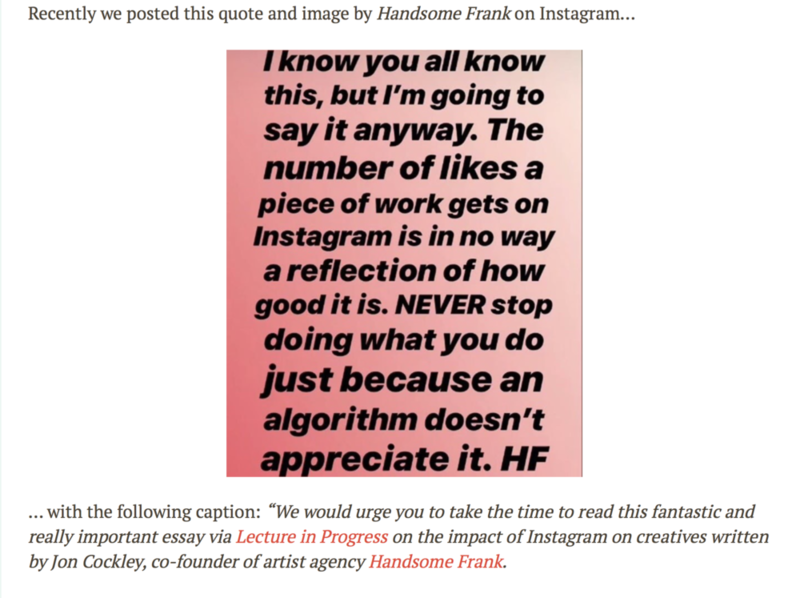 My response was to an on-line article for Lecture in Progress by Handsome Frank which was subsequently featured on The Design Trust’s Instagram account. “This is an important conversation to have. Awareness is everything around these topics. A couple of extra thoughts come to mind. Just because a post isn’t liked doesn’t mean it’s unseen. Many art directors are observing IG without necessarily interacting. I receive a lot of positive feedback on my IG account in meetings from clients or art directors who haven’t ever liked a post.